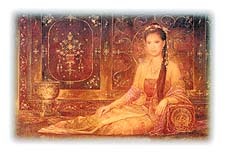 HISTORICAL MYSTERY: Whatever the real story behind Princess Suphankalaya of Ayutthaya, there is no doubt she inspires hope and heroism in many people An artist's impression of Princess Suphankalaya. The picture was commissioned by Dr Nalinee. Born a princess, married to the invader of her kingdom and later tortured to death, the short and tragic life story of Princess Suphankalaya of Ayutthaya is full of patriotic anecdotes which might have made her a colourful historical figure. The truth is, however, over the centuries she received little attention from either historians or the public. Barely mentioned in historical texts, she was largely relegated to the footnotes of the history of her famous brother, King Naresuan the Great who reigned from 1590-1605 and liberated the kingdom of Ayutthaya from Burmese invaders. But some 400 years after her death her name is being mentioned. Pictures of a woman in traditional costume, representing the image of Princess Suphankalaya, have been put up at some temples - among them Wat Yaichaimongkol in Ayutthaya and Wat Ladsing and Wat Don Chedi in Suphan Buri. The pictures have become objects of worship and some temples have even built statues of the princess. A steady flow of people wanting to pay tribute to the princess visit the images, bringing offerings such as sabai (a long piece of cloth traditionally worn as a top by Thai women) and other women's accessories. After years of obscurity she is in vogue. So what has prompted the surge of interest in the forgotten princess? It is difficult to say exactly when the trend began. However, a few years ago, a monk in Phichit province claimed he met the spirit of the princess in his meditation. He claims the princess related her life story to him. According to the monk, at the fall of Ayutthaya in 1569 the princess was taken to Burma with her younger brothers (among them Prince Naresuan) as hostages. There, she became King Bayinnaung's consort. As his story goes, out of love for her homeland the princess asked the Burmese king to let her brothers return to Ayutthaya and she would remain behind, alone, in what people at the time would have considered an enemies' house. After King Bayinnaung's death, King Naresuan declared Ayutthaya independent from Burma. In his anger and thirst for power, the new Burmese king, Nanthabureng, tortured and killed the princess who, according to the monk's tale, was pregnant. Life goes on, and so did the monk's unofficial biography, which claimed the princess' spirit was trapped by black magic and although she wanted to return to her motherland and help her people, she couldn't. Fortunately, the monk apparently broke the spell and at last the princess could return. The monk claimed all this in an article serialised by Chee Wit Tong Su magazine and in a booklet circulated in markets. Around the same time, there were stories claiming the princess' relics had been brought back to Thailand and put under her statue in Phitsanulok. The hype is not confined to the religious realm. Kantana Video Production plans to make a documentary and drama about the princess' life, and posters, calendars, cards, commemorative coins and other memorabilia related to her are in great demand. 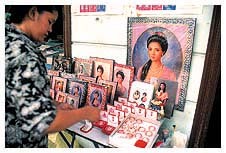 At Tha Phra Chan, a vendor in her 30s sells Princess Suphankalaya-related icons. She said: "They say Princess Suphankalaya protects Thai people. Some who worship her claim they became lucky ... they win the lottery or survive a car accident. Some say their lives are just better." "She's so popular I have to set a separate table to sell amulets, coins and pictures of her," said Ms Duan, another vendor. But beyond the myths and the word of mediums, does anyone really know what to believe about the princess? History books do not give much of a clue. The princess does not exist in the Ayutthaya chronicles, nor in the texts studied in schools and universities. She is mentioned, however, in two unofficial history books translated from old Mon and Burmese scripts. These scripts claim to document the history of Ayutthaya, based on the anecdotes of Thai prisoners-of-war including a royal prisoner, known as Khun Luang Ha Wat, who was held captive in Burma after the second fall of Ayutthaya in the mid-18th century. Dr Sunait Chutintaranond, head of the Thai Studies Section of the Faculty of Arts at Chulalongkorn University, said although they have never been accepted as official Thai history, researchers use these precious historical references in the hope they may help put the princess into a historical context. One of the spots where worshippers pay tribute to Princess Suphankalaya is at the monument of the princess and her two brothers at Wat Ladsing in Suphan Buri. Both of the two translated versions confirm the princess' existence and say she was the elder sister of King Naresuan the Great, who fought for Thailand's independence from Burma more than 430 years ago. Somewhere between the paranormal claims and the official accounts lies the reason for the princess' popularity and there is no doubting her tale is inspiring. Pthomrerk Ketudhat, associate dean of the Faculty of Sociology and Anthropology at Thammasat University, tries to explain the trend. "In times of political and economic hardships, there are usually images that people revere and put their hopes on. They search for the image of an ideal leader," he said. In stalls Princess Suphankalaya's pictures are often found beside King Rama V's coins, and pictures of King Naresuan and the Goddess of Mercy Kuan Yin. "Many believe her sacrifice (of letting her brothers return to Ayutthaya while she stayed alone in Burma) led to King Naresuan's subsequent declaration of independence," Prof Pthomrerk said. "She was brave, determined, far-sighted and patient enough to live in the enemy's land. She dedicated her life for the sake of Thai people. Perhaps, this is the type of leader Thai people are looking for now," Prof Pthomrerk said. Some view the princess as a symbol of "grace under fire", someone with the strength and patience to endure hardships. This is how obstetrician and gynaecologist Dr Nalinee Paiboon views Princess Suphankalaya. And she says the princess' life story helped her change her own life. In 1995, Dr Nalinee's life was at rock bottom after a divorce and losing her business. On a trip to Phitsanulok she went with her aunt to pay respect at King Naresuan's monument. On the trip her aunt mentioned people had all but forgotten Princess Suphankalaya. "The mention of the princess shook me. I thought, why didn't I think of her before? She is a woman like me. I recalled an anecdote about her that I had learned in school. I realised and appreciated her strength and bravery, and the patience and compassion she showed. She sacrificed her life for people," said Dr Nalinee, 40. "I found strength in the story. I knew what I would do. Before, I just couldn't think straight. I had allowed myself to be sunk in sorrow." Dr Nalinee got her life back in order and became very successful in her business. In gratitude to the princess, she was determined to follow her way. "At these times we have to be brave, patient and strong to pass these political and economic hurdles. Most importantly, we should do something for our nation as the princess did for us." Each year, Dr Nalinee distributes free calendars bearing a portrait of the princess to the public. It is part of her attempt to make the story of the princess more widely known. She also set up a fund - the Mongkol Piya Suphankalaya - to give scholarships to 100 poor and orphan girls so they can get a higher education. Each month, she donates money to charity. The story of the princess seems to have touched people, though she seems to have more female believers than male. "The story of Princess Suphankalaya shows what society values in women," said Dr Chalidaporn Songsamphan, a lecturer on women's issues in the Faculty of Political Science at Thammasat University. "Women become national heroines simply because they have the kind of feminine character and display the values that society expects of them. Princess Suphankalaya is portrayed as an ideal woman: brave, merciful, kind, prompt to sacrifice herself for her family." Dr Chalidaporn said the princess' story is an example of how women achieve status through men. Portraits and icons of Princess Suphankalaya are selling very well at Tha Phra Chan market. "Princess Suphankalaya was considered a heroine because she played a supportive role to King Naresuan the Great in freeing Thailand. Without King Naresuan, the princess might not have become the heroine she is today," said Dr Chalidaporn. Assoc Dean Pthomrerk said the emerging face of a female symbol of worship may lead society towards recognising the value of characteristics associated with femininity. "Being female represents warmth and commitment to the family and the community. It might be good to have more positive images of women. It means we are paying more attention to family affairs and community strength," he said. Because of scant historical records, the story of Princess Suphankalaya may be based more on legend than fact. To set the record straight, Dr Nalinee is funding research by the Thai Studies Section at Chulalongkorn University to write the princess' biography. She hopes when the research is completed in a few months, Thais will know more about the princess and her contribution to the nation. "I want her to be in people's hearts for her actual deeds, not because of legends and rumours," said Dr Nalinee. She plans to distribute the research to schools, libraries, temples and the Ministry of Education. She also plans to pass the research to novelist Vimol Siripaibul, better known as Tomyanti, as material for a book. The work will also be published in the women's magazine, Kwan Ruen. For now though, people will have to be content with the mix of possible fact and fabulous fiction. Nobody knows what the research will turn up - whether it will confirm the tragic, patriotic details of the princess' life or whether it will negate the whole story. Dr Nalinee is philosophical, however: "No matter what is behind this craze," she said, "I think it is good to worship our ancestors."